London, 2016-Dec-13 — /Travel PR News/ — The colouring craze looks set to reach new heights as British Airways gets set to publish its first colouring book for flyers. ‘British Airways: A Colouring Book’ features scores of line drawings of iconic images, accompanied by explanations from the airline’s archive, spread over a bumper 96 pages. Pictures to colour in are based on exclusive historic photographs, travel posters, publicity images, adverts and artwork specially chosen from the extensive British Airways image archive. Costing £12.99, and published by Amberley Books, it will be on sale from December 15, just in time for Christmas, as the perfect present for flyers and aviation fans alike. 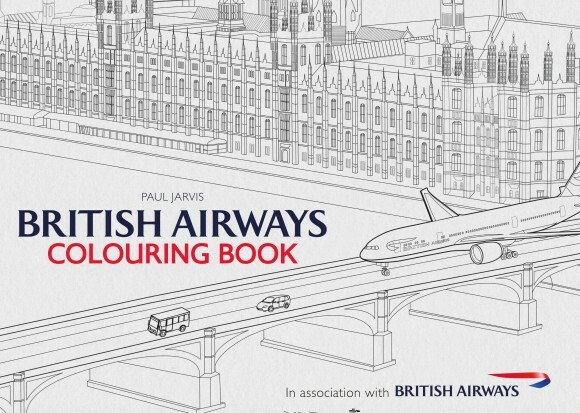 Paul Jarvis, author of the colouring book, and curator of British Airways’ Heritage Centre, said: “We know there is a huge interest in British Airways, and that colouring books have really caught the imagination of children and adults, so we are sure this colouring book will really take off. “We thought it would be a great idea to choose from our vast range of historic images, from the very early days of pioneering aviators nearly 100 years ago, through the golden age of travel with Imperial Airways and BOAC, right up to Concorde and the present day. Colouring books for children have long been popular, but the market for colouring books for adults has recently soared. Carefully colouring in the pictures is believed to be calming for many people because it relaxes the part of the brain related to fear and stress. It is also thought to stimulate the part of the brain responsible for creativity and logic. Author and curator Paul Jarvis has already published a number of books on British Airways, including ‘Mapping the Airways’, earlier this year, which looked at how British Airways and its predecessors used mapping for customers and flight crew alike. He also authored a lavishly illustrated history of the airline, ‘British Airways: An Illustrated History’, looking at its humble beginnings, from the company which operated the world’s first commercial scheduled airline service in 1919, to become the huge international carrier with a vast global network of flights we know today. British Airways’ Heritage centre is based at the airline’s head office, near Heathrow Terminal Five, and boasts as vast array of unique keepsakes, models, uniforms, seats and scores of images from the airline’s early days of aviation right up to the present day. From December 15, ‘British Airways: A Colouring Book’ will be available all good bookshops, through main internet book retailers and is available to order online from Amberley Books. This entry was posted in Airlines, Business, Recreation, Travel, Travel Marketing, Travelers and tagged British Airways, Paul Jarvis, publishes its first colouring book for flyers. Bookmark the permalink.